Home » Angel Numbers » Angel Number 2 Meaning? Discover The Truth! Angel Number 2 Meaning? Discover The Truth! Most people feel that they are destined for something greater than them. Indeed, we might feel empowered and compelled to do something great and meaningful in our lives. However, it can be difficult to pinpoint what road to take. Hence, with so many options laid out before us, it can often be overwhelming says angel number 2. Fortunately, there are spiritual entities that provide us with wisdom to aid in better understanding of our paths. Similarly, they might be calling us to action. If we do not understand the meaning of Angel Numbers, we may be missing out on these useful messages from our guardian angels. Angels use numbers to send us encoded messages. These can be useful to us because they provide us with direction and insight into our true paths. Therefore, by understanding these messages, we can learn more about ourselves. Also, you get to understand our connection to the natural and spiritual worlds and the journey ahead. What Does Angel Number 2 Mean? When Angel Number 2 is guiding you, you will see this number appearing spontaneously and often in your daily life. So, what is special about the number 2? This number holds significance relevant to your current situation. 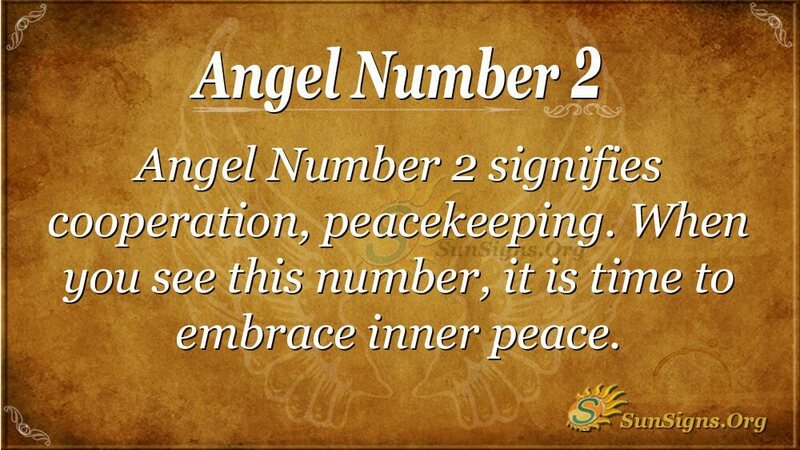 Angel Number 2 signifies cooperation and peacekeeping. Consequently, when you see this number, it is time to embrace inner peace. If you are experiencing conflict in the workplace or your home life, find a way to use the power of diplomacy to even things out. It is also a good time to work through problems or roadblocks. Your ability to reason and make compromise should be heightened at this time. When you see Angel Numbers appearing in your life, these messages are general guides from them. They will help to propel you to your ultimate goal. Your guardians can see your path and your divine purpose. They use this wisdom and these messages to guide you there. This is particularly true when angel number two is guiding you. What does 2 mean? Angel Number 2 represents balance and divinity. By achieving a sense of balance, you will be more able to reach your divine purpose. Angel Number 2 is also a sign of responsibility and service. Nothing comes without hard work, and you’ve been doing a lot of it. What Is the Spiritual Meaning of Angel Number 2? Your angels know that you have been striving to achieve your goal. Similarly, the spiritual realm is urging you to keep on moving forward. Even if progress seems grim and you haven’t seen a glimmer of success keep on trying. You’re getting close, and you shouldn’t give up now. Continue forward with the intention of being open and receptive to those around you. Be willing to work with others and learn from them. You might find yourself in a unique position to make new partnership and relationships, which could prove to be the key to your success. Trust in yourself and trust in those around you to help you achieve your mission. It might not be clear what this mission is, or what actions to take. These answers rarely come easily to us, but if you have the confidence to trust your intuition and an understanding of your relationship to the spiritual realm, then you already have the tools to achieve your goals. Pay attention to the Angel Number 2 that you encounter and feel secure in your actions. Even if you stray from your path, your Angels will be there to lead you back. Previous Angel Number 1 – Why Am I Seeing This Number?